As social channels have taken the whole world under the umbrella, and no one is untouched by their influence, businesses all over the world have now started publishing themselves socially. Social channels are indeed keeping everyone on the same page. Not only people are connected as family and friends, but also the businesses have started to flourish through them. These are the supreme places to maintain customer retentions and even to build new customers as everyone now-a-days is active on social channels such as Facebook and Twitter. These are the places where businesses can follow leads and observe their customers for their areas of interest. The product is in beta version and hence details about its editions and pricing are unavailable. The Social Box dashboard is a place where you are directed a soon as you login to your account or create your account. You can access areas such as the social channels, widgets, settings and account quickly via this place. It works with your social channels. You can add and integrate your social accounts from Facebook, Twitter and Instagram on one single place here. 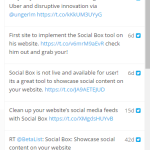 Social Box then connects to all the channels and web pages. As soon as your account is connected to Social Box, the application displays all pages created by the social account so that it becomes easy to track updates. Social Box allows you to make itself as a widget that can be integrated right into your website. Social Box provides the widget code that can be easily copied and added to your own website. Social Box lets you showcase your social activities right on your own website. And for this, all you need to do is, connect all your social channels to Social Box and make it a widget on your website. Now, all your visitors can view social activities. Currently, the tool doesn’t offer mobile apps. 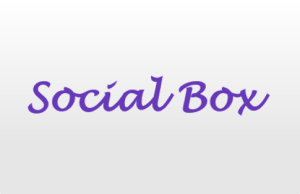 Social Channel management being the work place for Social Box, it integrates and connects seamlessly with Facebook, Instagram and Twitter accounts. The tool offers chat support to all the users as well as website visitors. The application has also its presence on Social Channels such as Facebook and Twitter which keeps its users and visitors updated about the application. Integrates all social channels at a single place. 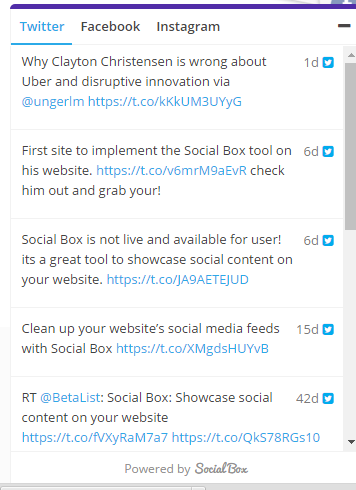 The Social Box interface is highly user-friendly and easy to use. Shows security issues with Mozilla Firefox, incompatible. Integration with LinkedIn would have added a great value to the application. Social Box can be an excellent application to manage and improve conversations with your customers and to drive in prospects converting visitors into customers. The application is highly simple to understand and use. One of the key differentiator about this product is, you don’t have to login in to the different social channels to manage them, and instead the widget can bring in all the real-time updates about them. For more details, please visit: Social Box website.